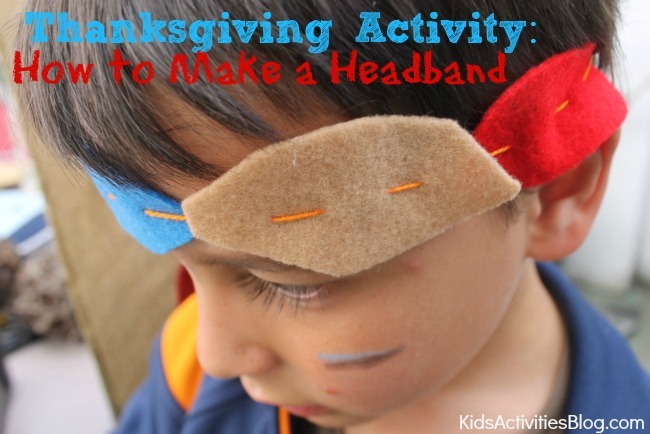 Your kids will love these simple directions for how to make a headband. This cute Thanksgiving activity awakens children’s imaginations as they learn about Pilgrims and Indians. Kids Activities Blog loves any activity that encourages imaginations and pretend play. 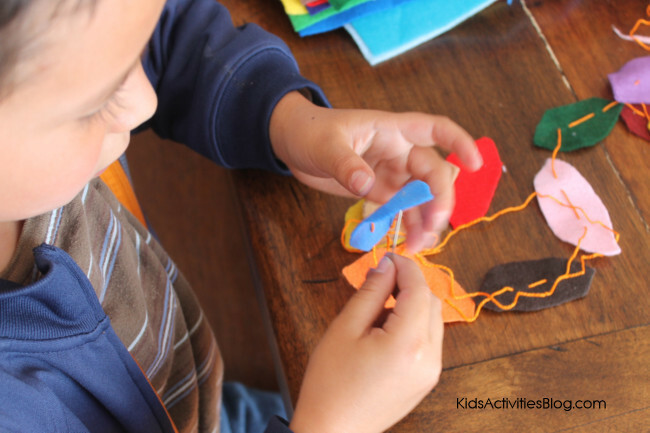 Don’t you just love finding activities for your child that help them discover their creative side and a new skill. My son was so proud of himself throughout this activity. He kept asking me “Mommy, am I really sewing?” He didn’t want to stop, he wanted to keep sewing everything and anything. 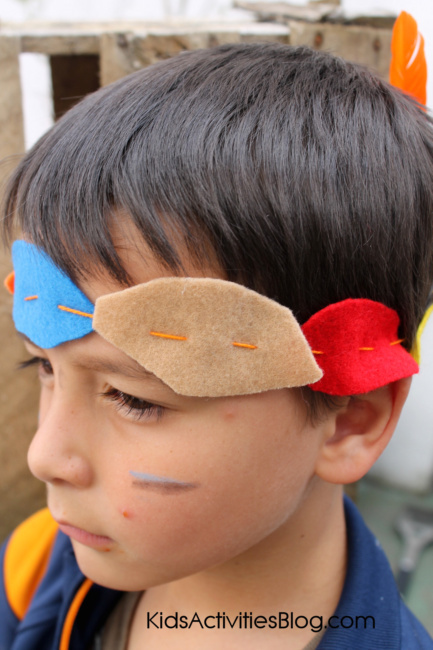 With November and Thanksgiving here you may find these felt Indian headbands useful as you explore our nations history and study Pilgrims and Indians. My boys automatically gravitate to the Indians over the pilgrims because in the stories we have read the Indians ride horses, own bow and arrows, paint their face and hunt animals. Every boys dream. Sewing is not every boys dream but it’s a great little activity to get them to explore another art medium. You never know where that skill will take them. My husband learned how to do some basics stitches when he was young and in college he had the opportunity to travel to Southern Africa and teach African women how to sew, helping them learn a trade so they can sustain themselves. See you never know where it will take you! 1. You will need to cut out leaves from the colored felt. I did most of the cutting because my son couldn’t quite cut through the felt. 2. Thread the needle. If it doesn’t have a blunt end then let your little one try to thread it. 3. If it’s the first time show your child how to do it with a few leaves. My son figured it out quite quickly and was sewing all on his own after the first three leaves. 4. Make sure you add enough leaves to go around your child’s head. 5. Tie the leaf head band around your child’s head and add the feathers to the back. Previous Post: « 5 minute Greek-ish Salad Recipe! This is so awesome! I have a bunch of felt that is sitting around just waiting for a craft like this. I can’t wait to do this with my kiddos. I’ll probably save it for Thanksgiving day.